The turn of the year 2012 marked the start of centenary celebrations for Cambridge United, and on a chilly late January evening, fireworks erupted overhead. The festivity was not in celebration of the U’s, however; it marked another centenary, with friends and family gathered on the pavement in Green Park to celebrate the 100th birthday of a local lad. Luke Emson told the Ed Chapman story in 2012. Following the entertainment and an outbreak of Happy Birthday with champagne held aloft, Ed retreated to the warmth of his living room, where he looked back on his memories of football in years gone by. This is Parker's Piece, where Ed Chapman watched Abbey United play and where Cambridge cricketer Tom Hayward held an annual charity challenge match. 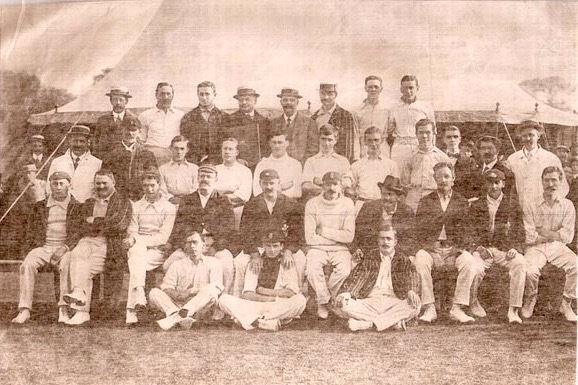 The great England batsman Sir Jack Hobbs, whom Ed dropped when he was on 99, is second from the right in the front row in this photo from the 1910 match. Hobbs' early life was spent in great poverty in the Barnwell area of Cambridge – also the birthplace of Abbey United. His local club has played in five different locations in his lifetime, with the newly-formed Abbey United playing on Midsummer Common from the year of his birth until the First World War. In the club’s 20th year, following spells at Stourbridge Common, Parker’s Piece and the aptly named Celery Trenches, United move once more to Newmarket Road, and to the site of the current Abbey Stadium. One summer, Ed had the pleasure of playing against cricket legend Sir Jack Hobbs, and agonises as he remembers dropping the England international on 99. The master proceeded to notch a century. Whilst Ed’s football days have passed, the sport continues to progress and Cambridge United will be looking to reflect on their history to formulate a springboard for success over the next century.